Stanley Clarke is an American jazz musician and composer known for his innovative and influential work on double bass and electric bass guitar as well as for his numerous film and television scores. Clarke began his study of music at age ten on the accordion. He played the violin next, then cello, but soon settled on the bass. "The bass was tall and I was tall; it was similar to a violin and a cello, which was the direction I was taking anyway, so I started playing the bass," Clarke said in an interview for the book Jazz-Rock Fusion: The People, the Music, by Julie Coryell and Laura Friedman. Clarke's early training was in classical music. He studied music formally at the Philadelphia Musical Academy. He began his jazz career in 1970 with the Horace Silver Band. In 1971 he joined Joe Henderson and later worked with the Stan Getz Band. While with Getz, Clarke met pianist Chick Corea, who also was a member of the band. In 1972 Corea formed his own group, taking Clarke along with him. The acoustic jazz group called Return to Forever "was a very energetic band," noted Mark Gridley in Jazz Styles, "whose flashy technical feats impressed musician and nonmusician alike." Corea then formed an electric Return to Forever, retaining Clarke, who switched to electric bass, and adding guitarist Al Di Meola and drummer Lenny White. The group was influenced by rock and was one of the forerunners of what was dubbed "jazz-rock fusion" music, combining the melodies and intricacies of jazz with the drive and power of rock. The band became increasingly popular until it broke up in 1976 and each member moved on to solo and other projects. Clarke had begun releasing solo albums while still with Return to Forever, and in 1976 he formed his own group. The Stanley Clarke Group has had various members over the years and continues to tour and record in between Clarke's other activities. In his solo efforts and with his own band, Clarke has explored and combined many diverse musical influences. As he told down beat, his music "has a lot of elements in it--rock and roll, jazz, r&b, funk, classical, Latin, African." In sessions outside his group, Clarke has worked with rock musicians as well as other jazz musicians. In 1979 he toured with Rolling Stones members Keith Richard and Ron Wood in what was called the New Barbarians tour. In 1980 Clarke teamed with jazz pianist George Duke as the Clarke/Duke Project and had a hit with the song "Sweet Baby." And in 1981 he played on Paul McCartney's album Tug of War. Clarke's talents are not limited to playing bass. He has composed a number of songs and has sung on records by Return to Forever and his own group. He has also produced albums for both himself and for other artists, including guitarist Roy Buchanan and singers Dee Dee Bridgewater and Flora Purim. He wrote a magazine column on bass playing for a while, and he has plans to write a multiple-volume work on the bass. Clarke told down beat, "I'm writing a book on acoustic bass, maybe three or four volumes. It's going to be the full thing--everything that anyone would want to know about the acoustic bass." Clarke had already earned a reputation as an accomplished jazz bassist even before joining Return to Forever. But "during his tenure as bassist for Return to Forever, Clarke established himself as one of the most prodigious instrumentalists in modern music: an exceptionally nimble, resourceful electric and acoustic bassist," says Mikal Gilmore of Rolling Stone. Joachim Berendt in The Jazz Book: From New Orleans to Rock and Free Jazz describes Clarke's talents by comparing him to two other noted bassists: "Stanley Clarke combines [Miroslav] Vitous's fluidity with Oscar Pettiford's 'soul.'" Clarke's distinctive style of play rejects the usual background rhythm role of bass players and moves the bass right to the forefront of his music. Says Clarke in the book Jazz-Rock Fusion, "Years ago there was a fixed idea that bass players played background, and bass players have this particular theme--kind of subdued, numb, almost looking numb, and just to make a long story short, I wasn't going for any of that." Clarke's trademark on electric bass is a metallic sound. He also imparts some twist on the strings, what Chuck Carman of down beat describes as putting "English" on them. Clarke concurs: "I found from plucking the strings in various ways that just the slightest movement can change your whole sound ... English is a great word. I just use English of various types on the strings." His solos are known for some very fast runs. Regarding his approach to soloing, he told Guitar Player magazine: "On electric bass, I use any finger, even my thumbs--anything!... I pluck mainly with three fingers. I have certain patterns that I can only play with four fingers. Sometimes when I get to those real fast runs that just fly, they'll be a fourth finger in there to help play it." Clarke's energetic style was influenced by the techniques of Scott LaFaro, bassist for Bill Evans. According to Mark Gridley in Jazz Styles, LaFaro created a modern style that made the bass not just a timekeeper but a melodic instrument. Young jazz bassists, including Clarke, who were influenced by LaFaro "interacted with pianists and drummers in an imaginative and highly active manner." Clarke himself told Rolling Stone: "I've always been more drawn to melodic than rhythmic playing ... I had all these melodies running around in my head, all this knowledge of classical music I was trying to apply to r&b and jazz, and I decided it would be a loss in personal integrity just to be a timekeeper in the background, going plunk plunk thwack thwack." Although Clarke has a reputation as a very fine musician, his move from pure jazz to jazz-rock fusion upset some jazz critics. His later projects with rock musicians, such as the New Barbarians tour, and the introduction of pop and rock themes into his music, have served to tarnish his image among some jazz "purists." Mikal Gilmore says that in recent years "Clarke has seemed to temper his talent, opting instead to play fairly prosaic, overbusy variations of rhythm & blues and even heavy-metal music." Gilmore is especially critical of Clarke's collaboration with George Duke. He states that the music of the Clarke/Duke Project is "pointedly devoid of the sort of compositional or improvisatory prowess that earned either musician his standing in the first place." Some other critics echo Gilmore's sentiments. In a review of a Sonny Rollins album on which both Clarke and Duke played, Chris Albertson of Stereo Review sniffed, "Pianist George Duke and bassist Stanley Clarke, men of great jazz potential who were bitten by the chart bug before they could show us more than the tip of their talent, here prove that they have spent too much time in fusionland." Charges of commercialism, of "going Hollywood" have been especially biting. Don Heckman, in a High Fidelity review of the Clarke-produced Maynard Ferguson album Hollywood, quipped that "the title certainly tells you what to expect. But if there are any doubts, note that the album was 'produced and directed' by Stanley Clarke.... Jazz? Forget it." Clarke acknowledges the criticism he has received but is determined not to let it change him. Asked in down beat whether he knows any musicians who changed because of press criticism, Clarke responded: "I've seen guys do that, and I've seen them go right down the drain, too. That's one thing that an artist can't do--if any creative person starts listening to other people, he goes down." Clarke's penchant for exploring a number of different musical paths, he realizes, has led to much of the criticism. But as Clarke observed in down beat , "It would get boring for me if I just did one thing and played just one type of music for the rest of my life. I don't think I could take it." And Clarke told Rolling Stone , "I know it upsets some people, but I could never be a conservative jazz musician." And at least one critic has revised his opinion of Clarke. In a Stereo Review article, Chris Albertson remarked: "I used to think of Stanley Clarke as one of the defectors, a jazz man drawn away from his art by the waving of the green. Now I am inclined to think that I did Clarke an injustice." Clarke presents himself, both off and on the stage, in an engaging manner. "Stanley Clarke struck me as a person who nobody could help but like,"Carman wrote in down beat. "His expression was either a friendly smile or a more intent look as he listened to questions. Several times during the course of the interview he shied away from 'naming names,' when it might conceivably reflect adversely upon someone." In reviewing a 1983 reunion tour of Return to Forever, Bill Milkowski of down beat said, "Clarke remains the same crowdpleaser he always was, an engaging presence with a flashing smile, playing up the rock theatrics during his explosive solos." Since the 1980s, Clarke has been turned much of his energy to television and film scores. He is creditd for the scores for the ABC Family Channel series Lincoln Heights as well as composing the theme song for the show. In October 2006, Clarke was honored with Bass Player magazine's Lifetime Achievement Award. He was honored with the Key to the city of Philadelphia and put his hands in cement as a 1999 inductee into the Hollywood Walk of Fame on Sunset Boulevard. In 2004 he was featured in Los Angeles magazine as one of the 50 most influential people. BET-J launched a series hosted by Clarke entitled On the Road with Stanley Clarke in June 2006. The series consists of seven episodes titled "Origins of Black Music," "That Philly Sound," "Jazz Beyond the Classroom," "Black Music in Film, Television & Theatre," "Jazz," "Black Music in Film – The Next Generation:" and "Bass to Bass." Some of his guests include Terence Blanchard, Marcus Miller, George Duke, The Tate Brothers, Gamble and Huff, and academicians Dr. Jacqueline Cogdell DjeDje and Dr. Cheryl Keyes from the Department of Ethnomusicology at UCLA among many others. Clarke believes in making an emotional impact with his music, to touch his audience. To down beat he said, "I have an intention, regardless of what anyone thinks, to have my music reach out to someone.... I'm trying to get across good feelings." All in all, Clarke says that his goal is not to bore anyone. As he told Carman, "It's a nice goal to have. It keeps you busy." -Journey to Love Columbia, 1975. -School Days Columbia, 1976. Modern Man Columbia, 1978. -I Wanna Play for You Columbia, 1979. -Rock, Pebbles, and Sand Epic, 1980. -Let Me Know You Epic, 1982. -If This Bass Could Only Talk Portrait, 1988. -Return to Forever ECM, 1972. -Hymn to the 7th Galaxy Polydor, 1973. -Light as a Feather Polydor, 1973. -Where Have I Known You Before? Polydor, 1974. -Children of Forever Polydor, 1974. -The Best of Return to Forever Columbia, 1980. -The Clarke/Duke Project (with George Duke), Epic, 1981. The Clarke/Duke Project II (with Duke), Epic, 1983. -Hideaway (with George Howard, Herbie Hancock, Stanley Jordan, Stewart Copeland, Angela Bofill, Larry Graham, and others), Epic, 1986. -Also has played on record albums by a number of other artists, including Carlos Santana, Aretha Franklin, Quincy Jones, Paul McCartney, Sonny Rollins, and Chaka Khan. 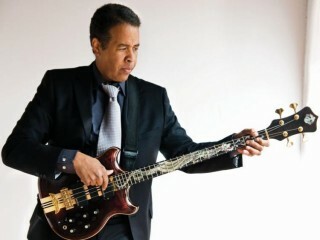 View the full website biography of Stanley Clarke.